Lubrita Antifreeze BS-ANFOR is a nitrite, amine and phosphate-free, environmentally-friendly antifreeze for coolant circuits of combustion engines based on 1,2 ethylene glycol (mono-ethylenglykol), which guarantees a maintenance free corrosion and frost protection. Lubrita Antifreeze BS-ANFOR can be used in cooling systems with light alloy engines. antifreeze. The operating instructions of the vehicle and engine manufacturers must be observed. (Spain), BS 6580 (GB), CUNA NC 956-16 (Italy), JIS K 2234 (Japan) O Norm V 5123 (Austria). 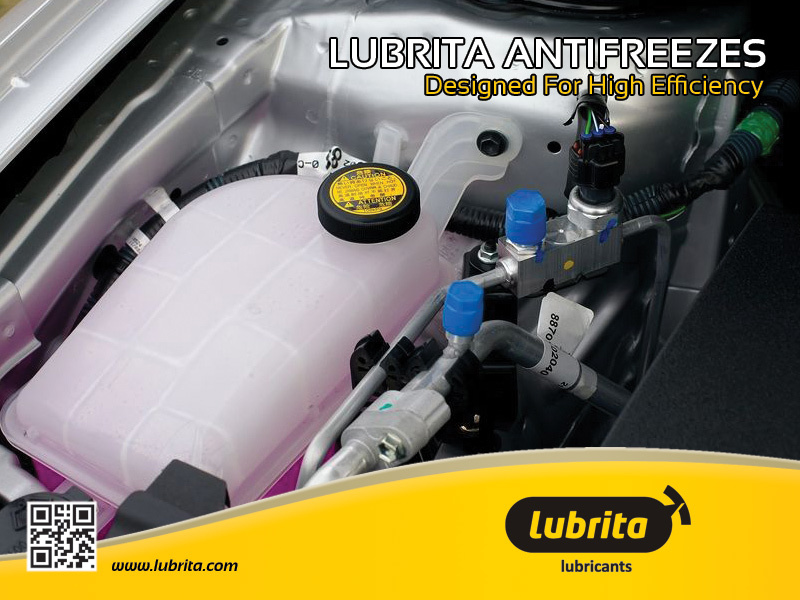 Lubrita Antifreeze SF is a silicate-free, environmentally-friendly antifreeze for coolant circuits of combustion engines based on 1,2 ethylene glycol (mono-ethylenglykol) which guarantees a maintenance free corrosion and frost protection. Lubrita Antifreeze SF can be used in cooling systems with all-aluminium engines. Lubrita Antifreeze SF offers necessary protection against corrosion formation, frost and overheating in summer. Instructions for use: clean the cooling system, check tightness and flush trough. Mix Lubrita Antifreeze SF fresh water (according mix table) and pour it in. Run the engine up to normal running temperature and then top up as required with the mixed antifreeze. The operating instructions of the vehicle and engine manufacturers must be observed. MB 325.3, FORD WSS-M97B44-D (from model year 1999), MAN 324 SNF, MTU MTL 5048, OPEL-GM 6277 M, OPEL-GM B 040 1065, Porsche, VW-Audi TL 774 D/F (according G 012 Plus- Quality). Application information MAN: Prohibition of mixing with type NF and type N. Cooling water hoses made of silicone according to MAN 334 type 3 (blue) are not allowed to be used in conjunction with coolants according to MAN 324 type SNF.